Gantry cranes provide economical material handling in areas where an overhead crane system is not available or practical. Their safety and efficiency make them a frequent choice for production, installation and maintenance applications. They are often used in maintenance shops, machine shops and loading areas. 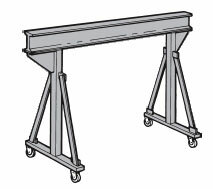 Mobile gantry cranes have four roller-bearing steel wheels for easy maneuverability. 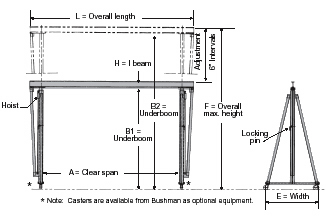 Casters are available in a wide variety of sizes and styles. They can be provided as an option from Bushman Equipment, Inc., or the purchaser may provide them. 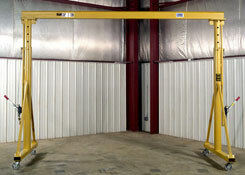 Bushman Equipment, Inc. gantry cranes are available in either fixed or adjustable height models. Both types can be disassembled into three components for portability. The structural steel legs are welded together at the factory. 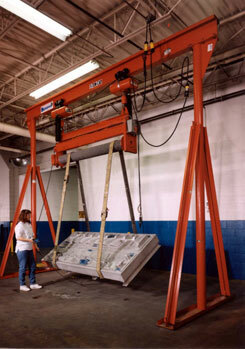 The model 430 fixed height gantry crane is an economical choice, widely used in both industrial and retail facilities. 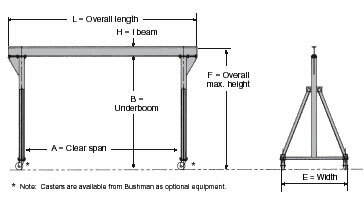 Bushman Equipment, Inc. can provide fixed and adjustable height gantry cranes with capacities up to 10 tons, spans up to 30 feet and under boom heights up to 18 feet. The model 431 telescopic gantry provides an adjustable mechanism for raising and lowering the beam to suit specific clearance requirements. The beam is raised and lowered by ratchet lever chain hoists attached to each leg. Locking pins are inserted in the legs at the desired height to provide a safe means of load support. The ratchet lever chain hoists are provided as standard equipment with all Bushman Equipment, Inc. telescopic gantry cranes. Telescopic gantry cranes are available with capacities up to five tons, spans to 30 feet and maximum under boom heights to 18 feet.